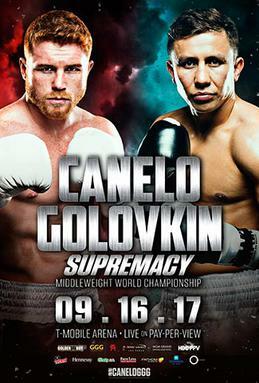 This is a real fight between two boxing professionals for the unified WBA, WBC, IBF, Ring Magazine and lineal middleweight championship. who do you think will win? Both are very good boxers with exemplary record so it is very hard to say abuot it. Since Canelo is the cash cow who's still in his prime and Golovkin probably has 3 or 4 fights left in his career, who do you think they're going to favor if it's a close fight? Canelo doesn't have to win, he just has to make it competitive and he will win. For GGG, check out his fight with Kell Brook or his fight with Lemieux to see him break somebody down without turning their lights out. That's a big difference, GGG's opponents are often still conscious when the fight is stopped. As far as I know Golovkin has literally never even been rocked. He is know to have diamond chin. Everybody knows Canelo is a big puncher and can definitely hurt GGG, but to be honest I am not sure Canelo can get enough shots off to end Golovkin without getting caught by GGG. On the other hand Canelo's chin has really never been tested either. The last guy that he faced that had power was maybe Cotto who was already too small for weight class. You can say the same about Kirkland who was was way too overmatched for his power to even make a difference. And the one difference in Canelo and Golovkin's power is that I believe GGG has more one punch power that can end a fight at any time while Canelo is a guy who wears down opponents with combinations. Right now odds are in favour of GGG. More money will come in on Canelo as the fight gets closer, and I'll throw down on GGG by decision at the last minute. Too much footwork, experience, fitness, and natural power. Probably going to cut off the ring with the jab and look to counter Canelo's counterpunches. Will make Canelo hesitant to throw in combination and thus unable to win rounds since he won't slow GGG down with single punches.